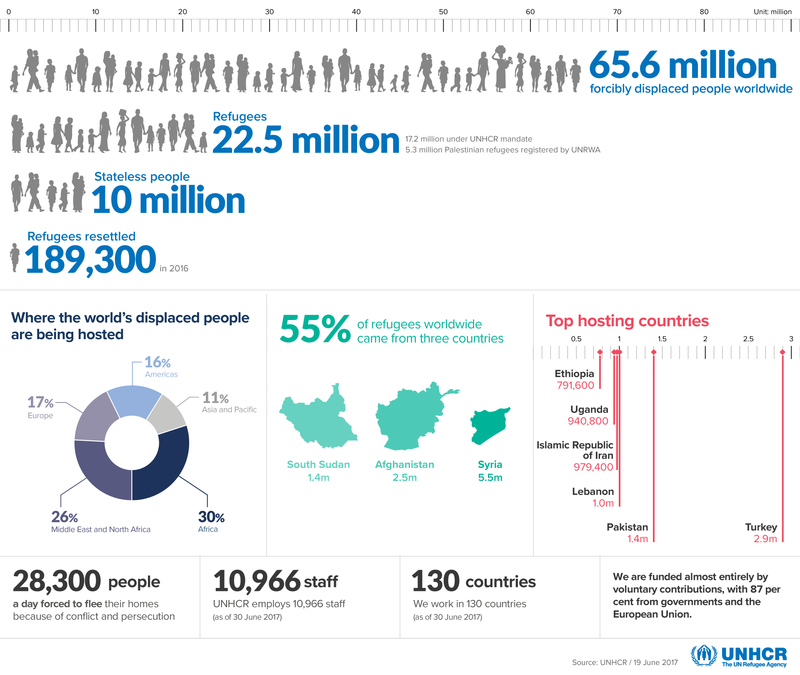 The global refugee population would make it the world's 23rd largest country. Refugees and refugee protection have become global issues, in a number of ways. Firstly, geographically. There is no region of the world not affected, whether as a producer or a receiver of refugees, or as a country of transit. Secondly, in the causes of migration. These form a broad spectrum, including forced migration, due to persecution, conflict, environmental issues and violation of human rights; economic migration; voluntary migration; and, in several cases, people migrating for different reasons but following the same routes at the same time. This variety creates a challenge for the specific needs of refugee protection, especially when global actions and policies contributing to migration are not made accountable. Thirdly, in the sheer number of refugees. 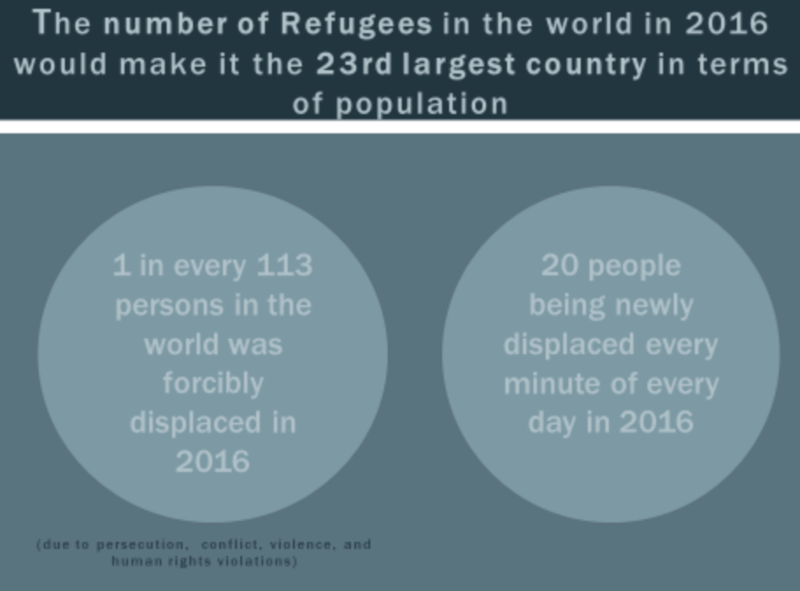 There is a record high of 65.6 million persons forcibly displaced due to conflict, persecution and human rights violations, according to the UNHCR, of which 22.5 million are refugees and 2.8 million are asylum seekers. A rhetoric presenting the current flow of refugees as a “refugee crisis” has emerged. Considering the numbers, this may be so. But in a historical context, the picture is different. In 2015, the EU’s 27 member states received 942,400 refugee claims. But during the 1992 refugee crisis, with only 12 member states, the EU received 696,500 refugee claims. Twenty-five years ago, the EU was receiving many more refugee claims per state, pro rata. The current rhetoric of a “refugee crisis” underscores, in reality, a lack of political will to protect refugees. This is reflected by the closing of borders, the securitization of migration and the criminalization of migration and of migrants, presented through the logic of “national security”. States are not rejecting human rights outright, in favour of “national security”. Instead, they adopt a logic of “human rights but”. They acknowledge human rights, but claim that other concerns such as national security and economic protection – justified or not – are more relevant and should take priority. This creates a huge gap between the protection needs of refugees, and what states are willing to provide. This is the crux of the real crisis for refugees. This approach by states contributes to further human rights violations, such as migrants’ deaths and increased risks during their journeys, coyotes, smugglers and traffickers, unaccompanied or separated children migrating alone, and disappearances of children once they have reached “safe territories” (perhaps up to 60% of those who do, according to some estimates). It also fosters a logic of “us vs others”, in which migrants are cast as “others”, “strangers at our doors”, and tools in other political battles. This creates a crisis for refugees, in which they are caught up in a circle of constant human rights violations – sometimes even through the policy of a state. 5) lack of respect to specific vulnerabilities (such as those of children, women, the elderly, persons with disabilities and LGBT refugees). These violations occur when refugees are on the move, once they have reached “safe” territories, and even when they have found shelter. Consider refugee camps, for example, in which access to economic and social rights, and durable solutions, are scarce. Furthermore, the number of resettlement places is diminishing, along with funding that even at its highest levels was not enough to meet the needs of refugees. Refugees are persons fleeing from a well-founded fear of persecution due to religion, nationality, race, political opinion or belonging to a social group. In some parts of the world, such as Latin America, they are also fleeing from gross and generalized violation of human rights. A person remains as a refugee for 20 years, on average. While refugees are already victims of human rights violations, the current international scenario is re-victimizing them while they seek protection. However, such ongoing violations do not stop migration. They only make it harder and more hazardous. They endanger the lives of refugees, and jeopardise the right to migrate. We must face these challenges. Refugees are not solely an issue of 2015 or 2017, but one of the contemporary world and its nation states. Refugees are an issue of human rights and protection, and a defining issue of this century so far. Refugees are not the problem – they are not the creators of the crisis. Refugees are the victims of the crisis. Protection strategies need to be re-designed, reformulated, and implemented in different ways to confront the current scenario. While migration is a constant phenomenon, forced migration cannot be seen as unchangeable or unimportant. “The refugee crisis is humanity’s crisis”, as Zygmunt Bauman stated. It is essential to rethink the logic of migration governance, with the human being as its axis. The protection of other humans must take centre stage. It must guide every strategy, policy and action. When it does, refugees’ rights and human rights will be respected.